One thing has become clear in the course of ecumenical discussion. What now divides Christians is not a difference in the description of the Holy Trinity or of the Incarnation of Jesus Christ. Doctrinal disagreement centres largely around the nature of the church, the sacramental mysteries of the church, and the ministry of the church. These differences have their source primarily in our understanding of and attitude to reality as a whole. In our time, we who are the product of an educational system shaped by western civilisation, are very much the victims of the Enlightenment. We have learned a particular way of reasoning, based on logical demonstrability and functional usefulness as the most important criteria for argument. The Christian theology shaped by that rationality partakes of all the defects of that way of looking at things. This way leads to a cleavage in our understanding and thinking. Some of us like to think in terms which can be clearly rational, and seek only that which is functionally efficient and useful. This is a way of thinking inherited from western civilisation through the educational system, and it has important consequences for our culture as for our faith. The clearest evidence of this victimisation by western civilisation occurs in the area of art. Our perceptions about reality are more deeply expressed in art, music, sculpture and architecture than in our rational discourse. We have today become poor in art and architecture, in music and painting, primarily because, following western civilization, we have put more emphasis on logical discourse and functional utility, and abandoned our own artistic creativity for the sake of a very superficial rationality. This affects our perceptions of God, of the Incarnation, of the Church, and of its ministry and sacraments. We have today a functional understanding of the Church and of its sacraments, primarily in terms of their usefulness understood in rational terms. Our document on the Ministry, which we are discussing today (BEM, Faith & Order Paper III) suffers from the same defect, though it strives hard to state in logical terms some of the classical perceptions about the nature of the Church and her sacramental ministry and mysteries. The document speaks about the “authority and responsibility” (9) of ministers, but it does also speak of the ministers’ presence which “reminds the community of the divine initiative act” (12)x . A proper treatment of the ministry and the sacramental mysteries should deal with both of these aspects – (a) meaning and (b) function. But (a) should not be in terms of (b) alone. 13. The chief responsibility of the ordained ministry is to assemble and build up the body of Christ by proclaiming and teaching the Word of God, by celebrating the sacraments, and by guiding the life of community in its worship, its mission and its caring ministry. 14. It is especially in the eucharistic celebration that the ordained ministry is the visible focus of the deep and all-embracing communion between Christ and the members of his body. In the celebration of the Eucharist, Christ gathers, teaches and nourishes the Church. It is Christ who invites to the meal and who presides at it. In most churches this presidency is signified and represented by an ordained minister. The two under-lined words are of crucial significance, for the churches which follow the ancient tradition. The signifying and representative character of the ordained minister is the major disagreement among our churches. (b) How is it represented? (c) Under what conditions is it represented? According to the document it is “the presidency” that is signified. Those who adhere to the ancient tradition would say that the “presence of Christ” is signified, not merely as “president”, but also as High Priest, as Prophet, as Messiah King and Pastor. We would also say that this presence is signified not only at the Eucharist, but throughout the life of the Church and of the ordained minister within it. But for those churches which do not recognize the Eucharist as participation in Christ’s once-for-all sacrifice, the concept of Christ as High Priest, and his sacramental presence in the Eucharist, may not make much sense. In the document’s discussion of the Eucharist, the sacrificial character of the Eucharist is recognized, but in terms like the ‘great sacrifice of praise’ (Eucharist 4), reducing the sacrifice to praise alone. When sacrificial words like ‘offer’ are used, they refer mainly to praise and prayer, but not to sacrifice as such. For the ancient tradition, the person of the bishop in the church and in its eucharistic sacrifice signifies more than ‘presidency’. He signifies sacramentally the eternal High Priest, Christ Himself, offering his own life (body and blood) to God the Father. The commentary 1:(8) on the Eucharist document refers to the Catholic understanding of the Eucharist as “propitiatory sacrifice” and calls on the churches to “review the old controversies about ‘sacrifice’ and deepen their understanding of the reasons why other traditions than their own have either used or rejected this term”. The document on the Eucharist then goes on to recognize the sacrificial character of the Eucharist in para 10: “In Christ we offer ourselves as a living and holy sacrifice in our daily lives”, but it cannot say that we do so primarily in the Eucharist, and only derivatively in our daily lives. This is good as far as it goes, except for that lousy word ‘function’ which has crept in. But it is only in the commentary and not in the main body of the Ministry document which of course means that we have no consensus among the churches on this point. We return to the question: What is signified in the presence of the ordained minister in the Eucharist and in the life of the Body of Christ? The document says, “this presidency, signified and represented by an ordained Minister, is a sacramental presence of Christ the High Priest, the Perfect Prophet and the Messianic shepherd-King (pastor) in the life of the Church”. What does ‘sacramental presence’ mean? To that we now turn. The mode of Christ’s presence in his body has to understood in sacramental terms, and that is why ordination is a sacramental mystery in the ancient tradition. But the terms ‘sacramental mystery’ and ‘sacramental presence’ are themselves subject to misunderstanding and misuse. ‘Sacramental mystery’ is a concocted term, half Latin, half Greek. In Hebrew Aramaic or Greek, there is no word for sacrament. Sacrament is therefore not a biblical word. In Latin it was a legal term for a pledge, a security deposit of money, a forfeit deposited in court as guarantee of bonafides. It also came to mean a military recruit’s pledge and oath, an oath of allegiance. The Western Church began using this word to mean signs of Christ’s pledge and promise – in the Eucharist, in the Baptism and in other symbolic actions of the Church. It was adopted as equivalent of the Semitic term raze’ d’ idtha (roze d’ idtho if you want the West Syrian pronunciation), which in Greek is tamyskria tes ekklesias, in Malayalam (sabhayude mauilka rahasyangal). But it was assimilated in the western concept to the idea of a pledge or guarantee of a promise, which is the sense in which Luther takes it. In the ancient tradition, a mysterion is a community participation in the hidden counsels of God, an initiation into the will of God as known in the community; but this is more than just a cognitive unsealing of a hidden secret. It is a transforming experience in which one is assimilated into the Kingdom of God as present on earth, into that company of the holy ones on earth and in the heavens (i.e. beyond the horizon of our senses). 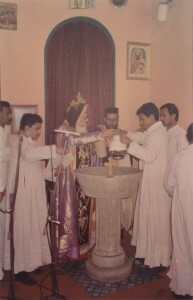 When we then re-adopt the Latin term sacramentum in a phrase like the “sacramental mysteries of the Church”, we mean something that makes real the community’s transforming participation in the heavenly reality of the Kingdom through earthly experiences like Baptism, Chrismation, Eucharist, Ordination, absolution, marriage, and the anointing of the sick. It is in relation to a concept like ‘sacramental mysteries of the Church’ that we use the other term, the “Sacramental Presence of Christ, the High Priest and Good Shepherd in the Church”. The episcopal college in the local church, i.e. the bishop with the presbyters and deacons, constitutes a sacramental presence of Christ the High Priest and Good Shepherd in his Church. All members of the body of Christ participate in this priestly and pastoral ministry of Christ; but the ordained episcopal college represents Christ with his apostles and disciples in a special way, a visible, consecrated presence within the Church, through persons specially set apart by special laying on of hands and invocation of the Holy spirit. It is this mode of presence that constitutes the specificity of the ordained clergy – not just their function, authority and responsibility, but their presence itself. It was a distortion of the real agreement when the ecumenical movement began focussing an ‘Apostolic Succession’ as the central issue. The real debate is about the “ordained episcopal college as sacramental presence of Christ the Good Shepherd in His church”. This mode always transcends the rational, moves into the realm beyond our senses where our rational conceptual framework must fall to pieces if not transcended. This is a fundamental philosophical question – the mode of Christ’s presence experienced in trans-rational categories. The BEM document as a whole is plagued by the conflict between its genuine desire to be loyal to the authentic tradition of the Church on the one hand, and the attempt to explain that heritage in the rational-functional categories of the post-Enlightenment western civilisation. 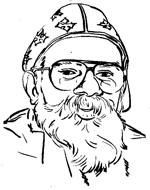 Until the concept of “sacramental mysteries of the Church” is clarified and in relation to that the other term “sacramental presence of Christ” is interpreted, any attempt to explain the ministry in purely rational-functional and missiological terms would be seen by the authentic tradition as woefully inadequate. The conditions under which this sacramental presence can be authentic need to be discussed. First of all, a sacramental Presence, separated from Him of whom it is the presence, loses its authenticity. It is only in sacramental union with Christ that the sacramental presence lives. In this way it is different from sign or symbol. Second, the Sacramental Presence is not a gift of the spirit for the individual bishop, presbyter or deacon, but something given for the Church, for its oikodone or upbuilding. Hence the Sacramental Presence becomes inauthentic when its integral relation to the whole community is broken. It is only in communion with the priesthood of the whole Church and on its foundation that the Sacramental Presence lives. 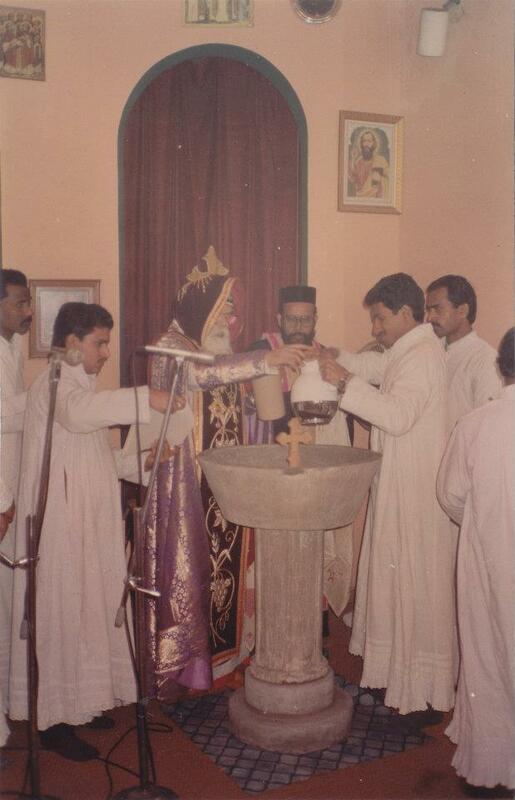 In the Eastern tradition, the anointing of a bishop takes place at the time of his baptism, when he enters into participation in the Priest-Shepherd ministry of Christ. There is no reanointing at the time of ordination. The priesthood of the whole church, in which all baptized-chrismated men, women and children participate, is the foundation and the milieu for the sacramental presence of Christ. Third, the sacramental presence of Christ in the Bishop, Presbyter and Deacon, cannot be exhaustively explained in terms of their functions alone. Their very person, body and mind, soul and spirit, is consecrated to be that presence. There is thus no “retirement” possible. One continues to be that presence so long as one lives. The person of the Bishop, Priest and Deacon is consecrated; not just their function. This is a major point of disagreement between the older traditions and the new rational-functional approach of much modern theology. In Christ there is neither male nor female; all are alike members of the Body of Christ and participate in the Priestly-Pastoral ministry of Christ as full members of the Body of Christ. This applies also to all baptized and chrismated children. There is nothing in the tradition of the Church, despite the instruction of St. Paul to the Corinthians, that forbids the teaching ministry to women. The tradition does not say that women are not allowed to proclaim the Kingdom or to exercise the ministry of pastorally up-building each other. In the long history of the Church, till very recent times, no woman has been consecrated as a bishop. We do not know of many women who were presbyter(s) in local parishes. We know about deaconesses in the Bible as well as in later times. When Christ appointed the Twelve, they were all males – possibly because they represented the Patriarchs of Twelve Tribes of the New Israel. We know about several apostles who were not of the Twelve- St. Paul, for example, as well as Andronicus and Junias (Rom 16:7) and perhaps James. But we do not know of a woman Apostle, though there must have been several women among those who were eye witnesses to the Resurrection of Christ – including Mary Magdalene (the first witness) and Joanna and Mary (Luke 24:9). We had women prophets (Lk.2:36, Rev.2:20) but no women Apostles of whom we know. We know that the arrangement made by the apostles in all the churches which they established was to set up a group of-male elders with a presiding male episkopos. This apostolic pattern has continued for nearly 2000 years without being questioned. For these traditions that put some weight on tradition, this is heavy weight indeed. Our BEM document seems to take the attitude: “the less said the better” on this issue. The second part of para 18 is very cursory treatment of the question indeed. The commentary on para 18 makes some cryptic allusions to the “nature of humanity and. . .Christology” which are far from clear. The document would have been much more useful if the case had been more adequately presented on both sides. As for the forms of the Ordained Ministry, the document nostalgically regrets that “there is no single New Testament Pattern”, as if the function of the New Testament were to set down patterns for the ordering of the Church. The Apostles set down certain patterns for the Ministry, and the Church has, throughout the centuries, made many changes and adaptations without (except in some cases) abandoning the basic three-fold pattern. The document recommends the three-fold ministry of bishop, presbyter and deacon as “an expression of the unity we seek and also as a means for achieving it” (22), though the pattern “stands evidently in need of reform”. There are many other areas like Apostolic succession and Ordination as Sacrament, where the document heroically tries to satisfy the Reformed and at the same time to be faithful to the authentic tradition. The success in this regard is commendable, but certainly not total. There is no dealing with the thorny problem that theologically understood, no person can offer himself or herself as a candidate for the ministry. It is the Spirit and the Community of faith that chooses and calls. In our systems this aspect has become largely nominal. For one who has laboured long with previous drafts of the Ministry documents this last version marks enormous improvement. As a discussion starter, this is a good document, except for its defects pointed out in the first part of this paper.